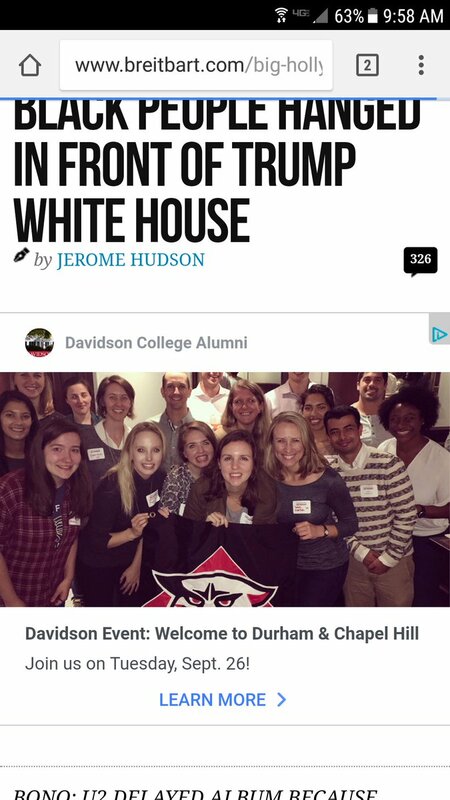 In September 2017, a Davidson College alumna alerted the college via a tweet that the Davidson College Alumni Association was advertising on the alt-right website Breitbart. The display of promotional material for Davidson College next to the ultra conservative and nativist rhetoric of Breitbart was not only a jarring juxtaposition, it was also completely inadvertent, an algorithmic outcome of Facebook’s advertising platform. Journalists have recently exposed other disturbing elements of Facebook and Google’s ad networks, such as the explosive ProPublica report that advertisers on Facebook could deliberately reach anti-Semitic audiences using targeted keywords and demographic information from Facebook’s vast data mining operations. Buzzfeed similarly showed how racist advertisers could exploit Google’s ad network. In Spring 2018 I am teaching one such JEC-designated course, Gender and Technology (DIG 340). This course counts toward both Digital Studies and Gender and Sexuality Studies major and minor requirements. Thanks to funding from Davidson’s momentous Justice, Equality, and Community grant from the Mellon Foundation, I am developing an assignment for DIG 340 that allows students to explore, critique, and undermine social media ad platforms. Quite simply, the assignment is to subvert social media advertising by placing justice, equality, and community-oriented materials in timelines and websites whose users would normally not encounter that material. Imagine, for example, a sponsored ad about Colson Whitehead, Davidson’s 2018 Reynolds speaker, appearing on a white supremacist website. Or #metoo promoted posts showing up on the timelines of so-called Men’s Rights activists. Working in groups of 3-4, students will manage a JEC-focused ad campaign of their own design on either Facebook, Twitter, or Google’s ad platforms. As students explore the contours, possibilities, and limits of social media advertising, each group will manage a series of campaigns with progressively larger budgets as they fine-tune their message and promotional strategy. Groups will have a budget of only $5 for their first campaigns. But as their campaigns grow more sophisticated, budgets will increase. Groups will have $100 for their final campaigns. All the while students will critically examine the advertising apparatuses themselves, analyzing overt and implicit ideological assumptions built into the platforms. Students will be aided in this process by Sara Wachter-Boettcher’s important new book, Technically Wrong: Sexist Apps, Biased Algorithms, and Other Threats of Toxic Tech (2017). Our implementation of the assignment is a few months away, and I am eager to hear your ideas about it. Thoughts, comments, suggestions? 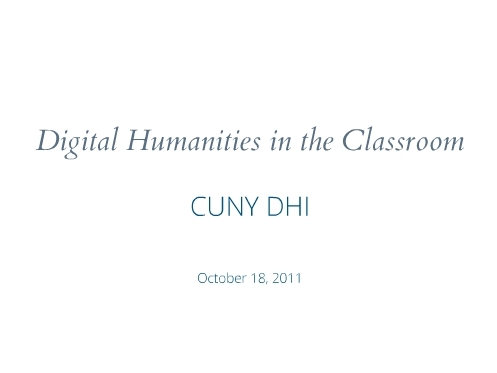 I am revamping “Introduction to Digital Studies,” my program’s overview of digital culture, creativity, and methodology. One approach is to partially organize the class around file types, the idea being that a close reading of certain file types can help us better understand contemporary culture, both online and off. This list is just an initial start, of course. What other culturally significant file types would you have students consider? And what undergrad-friendly readings about those file types would you recommend? What are the bottlenecks of Davidson Domains? Schnitzer, Jannis Andrija. Siggi’s Bottleneck. Photograph, April 10, 2010. Flickr. https://www.flickr.com/photos/xjs-khaos/4530132195/. A bottleneck is a great conceptual metaphor to describe those pedagogical moments where a significant number of learners get stuck. Identifying bottlenecks is the first step toward designing learning pathways through those bottlenecks. I’m borrowing the idea from the Decoding the Disciplines project at Indiana University. As Joan Middendorf, one of the project leaders, puts it, “Bottlenecks are important because they signal where students are unable to grasp crucial ways of knowing in our fields.” The question of bottlenecks is a central concern in the opening weeks of the Davidson Domains Digital Learning Community. Let me backtrack. What is Davidson Domains? What is the Davidson Domains Learning Community? Davidson Domains is a pilot program that gives faculty, staff, and students a “domain of one’s own”—an online space for blogs, exhibits, research, creative work, portfolios, web development, programming, and more. Users name their domain and maintain control over it. Faculty and students can create a domain for their courses, but they can also use it outside of coursework. The Davidson Domains pilot is a partnership between the Digital Studies program, Davidson’s Center for Teaching and Learning, and our instructional technology team. The pilot is funded by the Andrew W. Mellon Foundation. Explore the possibilities of blended learning and social pedagogies. Underlying this mission is a fundamental concern of the liberal arts: to raise technical, philosophical, artistic, economic, and political questions about the role of the Internet on ourselves, our communities, and our practices. And we’re about to add capacity for 500 more accounts, making Davidson Domains available to nearly half the campus community. We haven’t tied the roll-out of Davidson Domains to any particular year of students (say, all rising seniors) or program (for example, the First Year Writing Program). Rather, faculty and students are developing their Domains Across the Curriculum (DAC) based on interest and need. Given that we’ve registered 500 accounts in 9 months, that’s a lot of interest and need. We kicked off Davidson Domains in December 2014 with a two-day workshop led by Jim Groom and Tim Owens. Jim and Tim are pioneers of the “domain of one’s own” movement and co-founders of Reclaim Hosting, our partner providing the actual domains. My collaborators at Davidson, including Kristen Eshleman, Anelise Shrout, and Katie Wilkes, have worked tirelessly with faculty and students on Davidson Domains as well. But this formal and informal faculty development isn’t enough. We don’t simply want a bunch of people using Davidson Domains, we want to build a community of practice around Davidson Domains. This desire for—as Etienne Wenger describes a community of practice—a group “of people who share a concern or a passion for something they do and learn how to do it better as they interact regularly” is the impetus behind the newly formed Davidson Domains Learning Community. Approximately 25 faculty, staff, and students will meet as a group throughout the semester to think through the rewards, challenges, and possibilities of Davidson Domains. Smaller affinity groups of 3-4 people will also meet on their own to explore more focused topics, for instance, using domains to foster student dialogue or to support longitudinal constructive student projects. How do domains fit in with other technologies (like Moodle)? Where do we find good models? What’s the balance between student agency and scaffolding? What about privacy and copyright? Can we preserve the work on domains? How does total and free access to online domains change teaching, learning, and research in a liberal arts environment? What happens when a community asks the same questions together, and repeatedly, over the course of the semester? These questions are not simply idle musings. They are research questions. The first tackles the underlying premise of the entire domain of one’s own movement, while the second tackles the notion of a learning community. Working with Kristen Eshleman, Davidson’s Director of Digital Learning Research & Design, I aim to systematically explore these questions, with the Davidson Domains Learning Community serving as our object of study. What are the bottlenecks for you or your students for working with Davidson Domains? We are just getting started with the learning community, and I can’t wait to see where we end up. I believe that Davidson Domains are essential for the liberal arts in the digital age, and this community of practice will help us explain why. I’ll record our progress here from a more conceptual perspective, while the nitty-gritty progress will show up on our learning community site. In the meantime I’ll leave you with the slides from our first plenary meeting. Source: What are the bottlenecks of Davidson Domains? 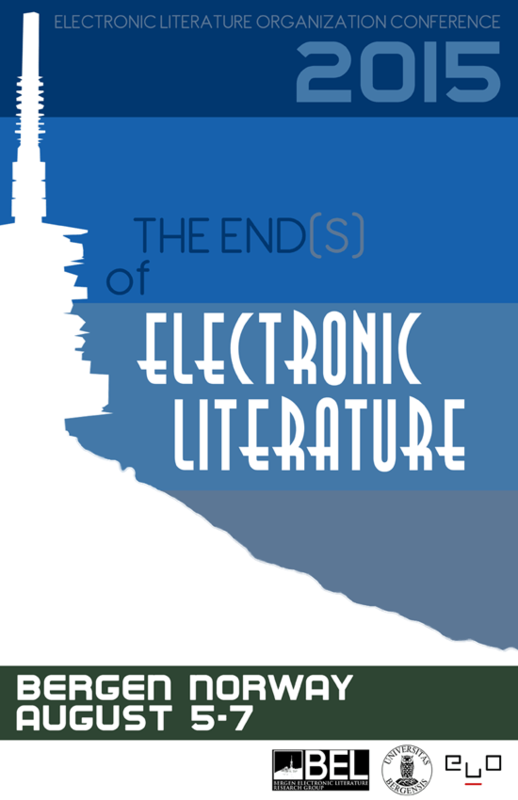 I’m at the Electronic Literature Organization’s annual conference in Bergen, Norway, where I hope to capture some “think aloud” readings of electronic literature (e-lit) by artists, writers, and scholars. I’ve mentioned this little project elsewhere, but it bears more explanation. The think aloud protocol is an important pedagogical tool, famously used by Sam Wineburg to uncover the differences in interpretative strategies between novice historians and professional historians reading historical documents (see Historical Thinking and Other Unnatural Acts, Temple University Press, 2001). The essence of a think aloud is this: the reader articulates (“thinks aloud”) every stray, tangential, and possibly central thought that goes through their head as they encounter a new text for the first time. The idea is to capture the complicated thinking that goes on when we interpret an unfamiliar cultural artifact—to make visible (or audible) the usually invisible processes of interpretation and analysis. Once the think aloud is recorded, it can itself be analyzed, so that others can see the interpretive moves people make as they negotiate understanding (or misunderstanding). The real pedagogical treasure of the think aloud is not any individual reading of a new text, but rather the recurring meaning-making strategies that become apparent across all of the think alouds. By capturing these think alouds at the ELO conference, I’m building a set of models for engaging in electronic literature. This will be invaluable to undergraduate students, whose first reaction to experimental literature is most frequently befuddlement. If you are attending ELO 2015 and wish to participate, please contact me (samplereality at gmail, @samplereality on Twitter, or just grab me at the conference). We’ll duck into a quiet space, and I’ll video you reading an unfamiliar piece of e-lit, maybe from either volume one or volume two of the Electronic Literature Collection, or possibly an iPad work of e-lit. It won’t take long: 5-7 minutes tops. I’ll be around through Saturday, and I hope to capture a half dozen or so of these think alouds. The more, the better. My five-year-old son recently learned how to ride a bike. He mastered the essential components of cycling—balance, peddling, and steering—in roughly ten minutes. Without using training wheels, ever. That idyllic scene of a bent-over parent pushing an unsteady child on a bike, working up enough speed to let go? It never happened. At least not with him. I’m not sentimental for that Norman Rockwell moment, because I had it several years earlier with my older son. I spent hours running behind him, steadying him, catching him. What made it so difficult for my older son to learn how to ride a bike? Precisely the thing that was supposed to teach him: training wheels. The difference between the way my sons learned how to ride a bike was training wheels. My older son used them, and consequently learned how to ride only with difficulty. His younger brother used a balance bike (the Skuut in his case), a small light (often wooden) bike with two wheels and no pedals. As the child glides along, thrust forward by pushing off from the ground, he or she learns how to balance in a gradated way. A slight imbalance might be corrected by simply tipping a toe to the ground, or the child can put both feet on the ground to fully balance the bike. Or anything in between. With a pedal-less bike you continually self-correct your balance, based on immediate feedback. I’m leaning too much to one side? Oooh, drag my foot a little there. Contrast this with training wheels. There’s no immediate feedback. In fact, there’s no need to balance at all. The training wheels do your balancing for you. Training wheels externalize the hardest part of riding a bike. If you’re a little kid and want to start riding a bike, training wheels are great. If you’re a little kid and want to start to learn how to ride a bike, training wheels will be your greatest obstacle. If you think of riding a bike in terms of pedagogy, training wheels are what learning experts call scaffolding. Way back in 1991, Allan Collins, John Seely Brown, and Ann Holum wrote about a type of teaching called cognitive apprenticeship, and they used the term scaffolding to describe “the support the master gives apprentices in carrying out a task. This can range from doing almost the entire task for them to giving occasional hints as to what to do next.” As the student—the apprentice—becomes more competent, the teacher—the master—gradually backs away, in effect removing the scaffolding. It’s a process Collins, Brown, and Holum call “fading.” The problem with training wheels, then, is that fading is all but impossible. You either have training wheels, or you don’t. Training wheels are a kind of scaffolding. But they are intrusive scaffolding, obstructive scaffolding. These bulky metal add-ons get in the way quite literally, but they also interfere pedagogically. Riding a bike with training wheels prepares a child for nothing more than riding a bike—with training wheels. My oldest child, I said, learned how to ride a bike with training wheels. But that’s not exactly what happened. After weeks of struggle—and mounting frustration—he learned. But only because I removed the all-or-nothing training wheels and replaced them with his own body. I not only removed the training wheels from his bike, but I removed the pedals themselves. In essence, I made a balance bike out of a conventional bike. Only then did he learn to balance, the most fundamental aspect of bike-riding. I learned something too: when my younger son was ready to ride a bike we would skip the training wheels entirely. My kids’ differing experiences lead me to believe that we place too much value on scaffolding, or at least, on the wrong kind of scaffolding. And now I’m not talking simply about riding bikes. I’m thinking of my own university classroom—and beyond, to online learning. We insist upon intrusive scaffolding. We are so concerned about students not learning that we surround the learning problem with scaffolding. In the process we obscure what we had hoped to reveal. Like relying on training wheels, we create complicated interfaces to experiences rather than simplifying the experiences themselves. Just as the balance bike simplifies the experience of bike riding, stripping it down to its core processes, we need to winnow down overly complex learning activities. We could call this removal of intrusive scaffolding something like “unscaffolding” or “descaffolding.” In either case, the idea is that we take away structure instead of adding to it. And perhaps more importantly, the descaffolding reinstates the body itself as the site—and means of—learning. Scaffolding not only obstructs learning, it turns learning into an abstraction, something that happens externally. The more scaffolding there is, the less embodied the learning will be. Take away the intrusive scaffolding, and like my son on his balance bike, the learner begins to use what he or she had all along, a physical body. I’ve been thinking about embodied pedagogy lately in relation to MOOCs—massive open online courses. In the worse cases, MOOCs are essentially nothing but scaffolding. A typical Coursera course will include video lectures for each lesson, an online quiz, and a discussion board. All scaffolding. In a MOOC, where are the bodies? And what is the MOOC equivalent of a balance bike? I want to suggest that unless online teaching—and classroom teaching as well—begins to first, unscaffold learning problems and second, rediscover embodied pedagogy, we will obstruct learning rather than foster it. We will push students away from authentic learning experiences rather than draw them toward such experiences. After all, remember the etymological root of pedagogy: paedo, as in child, and agogic, as in leading or guiding. Teachers guide learners. Scaffolding—the wrong kind—obstructs learning. Sacred Heart Mission photograph courtesy of Fernando de Sousa / Creative Commons Licensed. Scaffolding photograph courtesy of Kevin Dooley / Creative Commons Licensed. On November 2 and 3, George Mason University convened a forum on the Future of Higher Education. Alternating between plenary panels and keynote presentations, the forum brought together observers of higher education as well as faculty and administrators from Mason and beyond. I was invited to appear on a panel about student learning and technology. The majority of the session was dedicated to Q&A moderated by Steve Pearlstein, but I did speak briefly about social pedagogy. Below are my remarks. This morning I’d to share a few of my experiences with what you could call social pedagogy—a term I’ve borrowed from Randy Bass at the Center for New Designs in Learning and Scholarship at Georgetown University. Think of social pedagogy as outward facing pedagogy, in which learners connect to each other and to the world, and not just the professor. Social Pedagogy is also a lean-forward pedagogy. At its best a lean-forward pedagogy generates engagement, attention, and anticipation. Students literally lean forward. The opposite of a lean-forward pedagogy is of course a lean-back pedagogy. Just picture a student leaning back in the chair, passive, slack, and even bored. A lean-forward social pedagogy doesn’t have to involve technology at all, but this morning I want to describe two examples from my own teaching that use Twitter. Last fall I was teaching a science fiction class and we were preparing to watch Ridley Scott’s Blade Runner. Since I wasn’t screening the film in class, students would be watching it in all sorts of contexts: on Netflix in the residence hall, on a reserve DVD upstairs in the JC, rented from iTunes, a BluRay collector’s set at home, and so on. However, I still wanted to create a collective experience out of these disparate viewings. To this end, I asked students to “live tweet” their own viewing, posting to Twitter whatever came to mind as they watched the film. In this way I turned movie watching—a lean-back activity—into a lean-forward practice. And because the students often directed their tweets as replies to each other, it was social, much more social than viewing the film in class together. Over a 5-day period I had hundreds of tweets coming in, and I used a tool called Storify to track rhetorical and interpretative moves students made during this assignment. In particular, I categorized the incoming tweets, bringing to the surface some underlying themes in my students’ tweets. And then we began the next class period by examining the tweets and the themes they pointed to. Again I used Storify to capture my students’ essays and cluster them around themes. I was also able to highlight a Twitter debate that broke out among my students about the differences between the words alien and foreign. This was a productive debate that I’m not sure would have occurred if I hadn’t forced the students into being so precise—because they were on Twitter—about their use of language. And finally, I copied and pasted the text from all the Twitter essays into Wordle, which generated a word cloud—in which every word is sized according to its frequency. 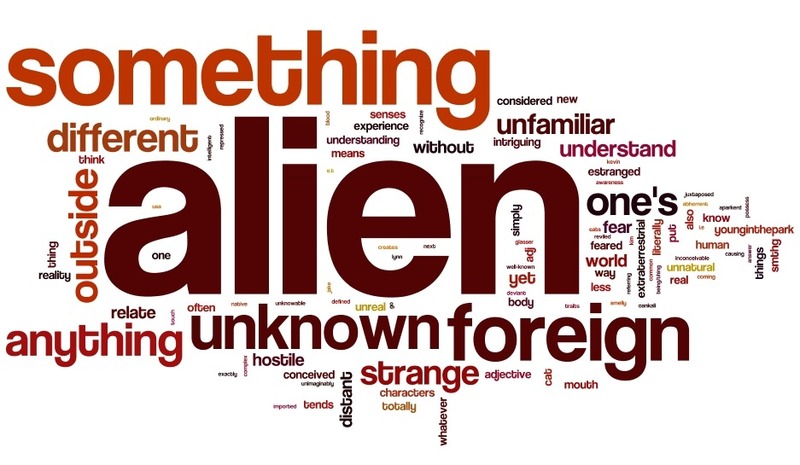 The word cloud gave me an admittedly reductivist snapshot of all the definitions of alien my students came up with. But the image ended up driving our next class discussion, as we debated what made it onto the word cloud and why. These are two fairly simple, low-stakes activities I did in class. But they highlight this blend of technology and a lean-forward social pedagogy that I have increasingly tried to integrate into my teaching—and to think critically about as a way of fostering inquiry and discovery with my students. 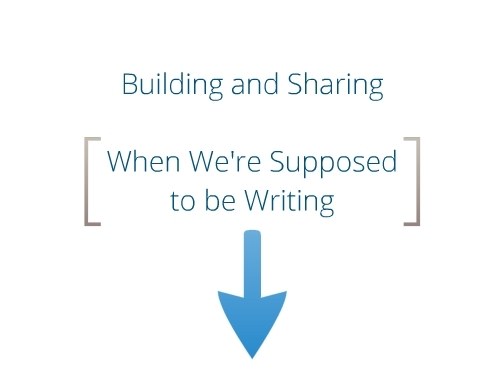 These are my notes “Building and Sharing (When You’re Supposed to be Teaching,” a lightning talk I gave on Tuesday as part of CUNY’s Digital Humanities Initiative. Shannon Mattern (The New School) and I were on a panel called “DH in the Classroom.” Shannon’s enormously inspirational lightning talk was titled Beyond the Seminar Paper, and mine too focused on alternative assignments for students. Our two talks were followed by a long Q&A session, in which I probably learned more from the audience than they did from me. I’ll intersperse my notes with my slides, though you might also want to view the full Prezi (embedded at the end of this post). I’d like to thank Matt for inviting me to talk tonight, and to all of you too, for coming out this gorgeous evening. I’m extremely flattered to be here—especially since I don’t think I have any earth-shattering thoughts about the digital humanities in the classroom. There are dozens and dozens of people who could be up here speaking, and I know some of them are here in this room right now. A lot of what I do in my classroom doesn’t necessary count as “digital humanities”—I certainly don’t frame it that way to my students. If anything, I simply say that we’ll be doing things in our classes they’ve never done before in college, let alone a literature class. And literature is mostly what I teach. Granted I teach literature classes that lend themselves to digital work—electronic literature classes, postmodern fiction, and media studies classes that likewise focus on close readings of texts, such as my videogame studies classes. But even in these classes, I think my students are surprised by how much our work focuses on building and sharing. 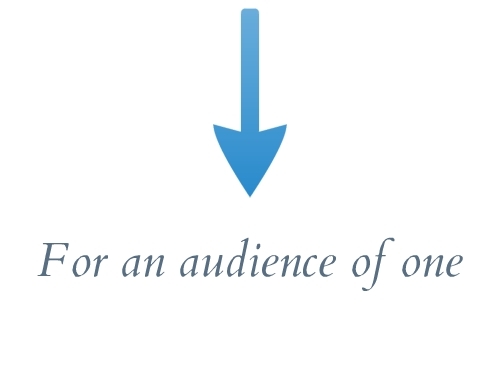 It’s writing for an audience of one—usually me, the instructor, us, the instructors. This is what counts as an audience to my students. They rarely think of themselves as writing for an audience beyond me. They rarely think of their own classmates as an audience. They often don’t even think of themselves as their own audience. They write for us, their professors and instructors. So the “sharing” part of my title comes from my ongoing effort—not always successful—to extend my students’ sense of audience. 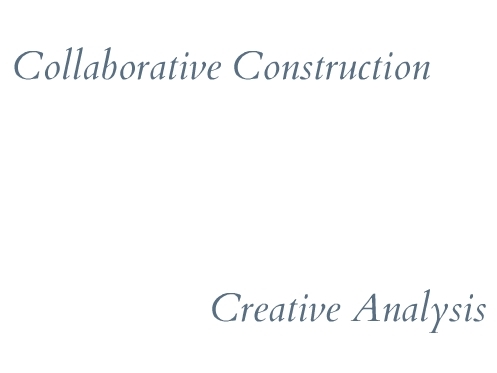 I’ll give some examples of this sharing in a few minutes, but before that I want to address the first part of my title: the idea of building. Those of you who know me are probably surprised that I’m emphasizing “building” as a way to integrate the digital humanities in the classroom. One of the most popular things I’ve written in the past year is a blog post decrying the hack versus yack split that routinely crops in debates about the definition of digital humanities. In this post, I argued that the various divides in the digital humanities, which often arise from institutional contexts and professional demands generally beyond our control—these divides are a distracting sideshow to the true power of the digital humanities, which has nothing to do with production of either tools or research. The heart of the digital humanities is not the production of knowledge; it’s the reproduction of knowledge. The promise of the digital is not in the way it allows us to ask new questions because of digital tools or because of new methodologies made possible by those tools. The promise is in the way the digital reshapes the representation, sharing, and discussion of knowledge. And I truly believe that this transformative power of the digital humanities belongs in the classroom. Classrooms were made for sharing. So, where does the “building” part of my pedagogy come up? How can I suddenly turn around and claim that building is important when I just said, in a blog post that has shown up on the syllabus of at least three different undergraduate introduction to the digital humanities courses? Well, let me explain what I mean by building. Building, for me, means to work. Let me explain that. In an issue of the PMLA from 2007 there’s a fantastic series of short essays by Ed Folsom, Jerry McGann, Peter Stallybrass, Kate Hayles, and others about the role of databases in literary studies. Folsom’s essay leads, and in it he describes what he calls the “epic transformation” of the online Walt Whitman Archive, which Folsom co-edits, along with Ken Price, into a database (1571). All of the other essays in some way respond to either the particulars of the digital Walt Whitman Archive, or more generally, to the impact of archival databases on research and knowledge production. It’s a great batch of essays, pre-dating by several years the prevalence of the term “digital humanities”—but that’s not why I mentioning these essays right now. I’m mentioning them because Peter Stallybrass’s essay has the provocative title “Against Thinking,” which helps to explain why I mean by working, which Stallybrass explicitly argues stands opposed to thinking. 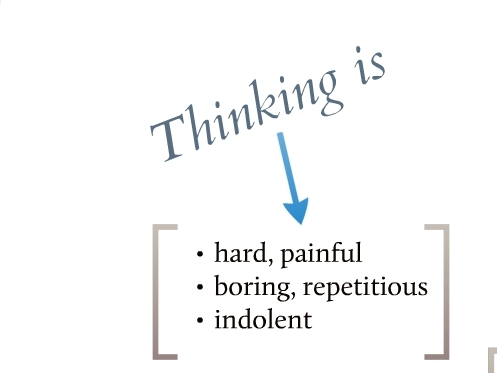 Thinking, according to Stallybrass is hard and painful. It’s boring, repetitious, and I love this—it’s indolent (1583). 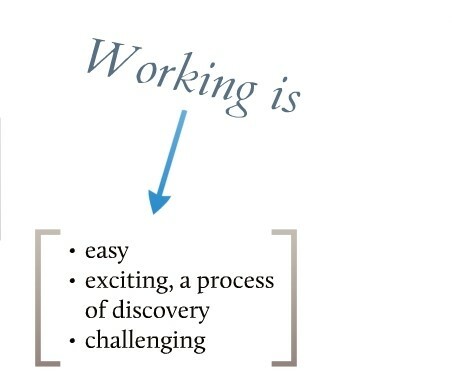 On the other hand, working is easy, exciting, a process of discovery. It’s challenging. This distinction between thinking and working informs Stallybrass’s undergraduate pedagogy, the way he trains his students to work with archival materials and the STC. In Stallybrass’s mind, students—and in fact, all need to do less thinking and more working. “When you’re thinking,” Stallybrass writes, “you’re usually staring at a blank sheet of paper or a blank screen, hoping that something will emerge from your head and magically fill that space. Even if something ‘comes to you,’ there’s no reason to believe that it is of interest, however painful the process has been” (1584). Stallybrass goes on to say that “the cure for the disease called thinking is work” (1584). In Stallybrass’s field of Renaissance and Early Modern literature, much of that work has to do with textual studies, discovering variants, paying attention to the material form of the book, and so on. In my own teaching, I’ve attempted to replace thinking with building—sometimes with words, sometimes without. And I want to run through a few examples right now. Folsom, Ed. “Database as Genre: The Epic Transformation of Archives.” PMLA 122.5 (2007): 1571-1579. Print. Stallybrass, Peter. “Against Thinking.” PMLA 122.5 (2007): 1580-1587. Print. Stroube, Sam. 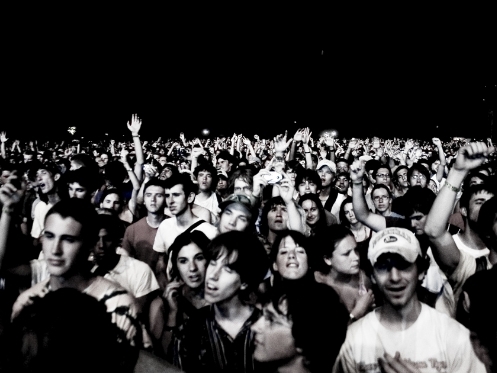 Radiohead Crowd. 2006. Flickr. Web. 20 Jan. 2009. One of the greatest mistakes we make in literary studies—and as teachers of literature—is privileging one form of literacy above all others. Namely, literacy as silent reading. In our classrooms, we view reading aloud with disdain. Asking students to take turns reading a text aloud offends our sensibilities as literature professors. It’s remedial. Childish. Appropriate for an elementary school classroom, perhaps, but it has no place in our hallowed halls of higher learning. How odd it is, then, that so many academic conferences in the humanities consist of nothing but rooms full of professors looking down at papers, reading them aloud. I can only imagine that this form of reading aloud is valid in our eyes while students reading aloud in our classes is not, because it is pedagogically and historically aligned with that realm of culture in which it is legitimate to read texts aloud—the realm of the sacred, the rite of the scripture, the ritual of someone we presume to be intellectually and spiritually superior exulting and professing before the masses. Which explains why we deem it acceptable for ourselves to read passages aloud in class, so long as it is done in a tremulous, dramatic voice. Reading aloud is a right reserved for the professor. And how wrong this is. How drearily, dreadfully, dismally wrong this is. Sheridan Blau argues in The Literature Workshop that one of the most powerful tools at the disposal of readers is rereading. And reading aloud—reading out loud—is in turn one of the most powerful ways of rereading. It’s active, performative, and engaging, an incredibly rewarding strategy for understanding difficult texts. And it’s a technique too easily tossed aside in the undergraduate classroom—and in the graduate student classroom for that matter. Not every professor has abandoned this seemingly elementary technique, of course; for example, my ProfHacker colleague Jason Jones has long defended the value of reading aloud. And last week in my Science Fiction course I was reminded of exactly how indispensable—and fun—reading aloud can be for students. This course is an upper level class full of English majors. And I mean full. There are 53 students enrolled, just about double my usual size of 27 students. And yet I try to lead this class with as much discussion and participation as a graduate seminar. We’re only three weeks in, but I’m delighted so far that I’ve been able to involve so many students, and hear so many voices over the course of our 75-minute sessions. Because my class last Thursday went particularly well, and because it highlights the value of students reading aloud, I want to walk through two activities we did. Both led to vigorous discussions that helped to illuminate some questions troubling my students about Volume I of Frankenstein, our first novel of the semester. These thoughts supported my spirits, while I pursued my undertaking with unremitting ardour. My cheek had grown pale with study, and my person had become emaciated with confinement. Sometimes, on the very brink of certainty, I failed; yet still I clung to the hope which the next day or the next hour might realise. One secret which I alone possessed was the hope to which I had dedicated myself; and the moon gazed on my midnight labours, while, with unrelaxed and breathless eagerness, I pursued nature to her hiding-places. Who shall conceive the horrors of my secret toil, as I dabbled among the unhallowed damps of the grave, or tortured the living animal to animate the lifeless clay? My limbs now tremble, and my eyes swim with the remembrance; but then a resistless, and almost frantic impulse, urged me forward; I seemed to have lost all soul or sensation but for this one pursuit. It was indeed but a passing trance, that only made me feel with renewed acuteness so soon as, the unnatural stimulus ceasing to operate, I had returned to my old habits. 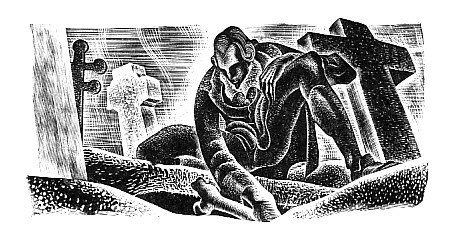 I collected bones from charnel houses; and disturbed, with profane fingers, the tremendous secrets of the human frame. In a solitary chamber, or rather cell, at the top of the house, and separated from all the other apartments by a gallery and staircase, I kept my workshop of filthy creation; my eyeballs were starting from their sockets in attending to the details of my employment. The dissecting room and the slaughter-house furnished many of my materials; and often did my human nature turn with loathing from my occupation, whilst, still urged on by an eagerness which perpetually increased, I brought my work near to a conclusion. We began by reading the passage aloud using what Blau calls the “jump-in” method. I’ve heard other people call it popcorn-style. We simply bounce around the room, with students voluntarily jumping in to read a few sentences to the class, after which somebody else jumps in, as if taking the baton from the previous reader. The professor doesn’t interrupt or call on anybody to read; the reading is totally student generated. After we finished reading the passage, we took nominations for the most important sentence or phrase from the paragraph—the sentence or phrase most pivotal or rich with interpretive potential. Peter Elbow would call it “the center of gravity” of the paragraph. The students shouted out these lines, and I typed them into this Google Doc, displayed live on the projection screen in the front of the lecture hall. With no debate of the nominees, we voted (by hand count) for the most significant of these ten lines. Finally, we had a class discussion, in which supporters of each line defended their vote. We didn’t discuss every line, especially since there was one clear “winner” and two runner-ups. 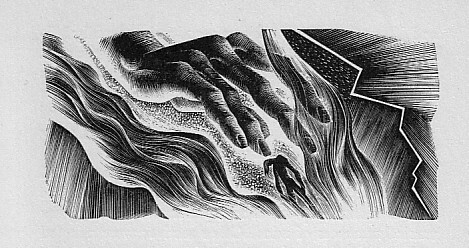 But even limiting our debate to three lines of the paragraph gave us three entryways into the passage, three facets which, when angled just right, revealed something new about Frankenstein—or rather, Shelley’s indictment of Frankenstein. I’m convinced that such a productive discussion wouldn’t have occurred if the students hadn’t first reread the passage aloud. I’m likewise convinced that merely asking students to reread the passage silently before the exercise wouldn’t have yielded such rich interpretive fruits. It’s the reading aloud that does it. The vocalization for the students who did the reading, the texture of the voices for the students who listened, the attentive anticipation of everyone as they awaited the next reader to jump in from the seat next to them or from across the room. We read yet another passage aloud, again jump-in fashion, afterwards. My goal this time was to pinpoint the precise moment when Victor Frankenstein goes from praising his act of creation to being repulsed by it. I was motivated by a student’s blog post, in which she had wondered why Frankenstein suddenly became horrified by his creature, when he had worked so hard to create it. To answer this question of why, we need to know when he became afraid. IT was on a dreary night of November, that I beheld the accomplishment of my toils. With an anxiety that almost amounted to agony, I collected the instruments of life around me, that I might infuse a spark of being into the lifeless thing that lay at my feet. It was already one in the morning; the rain pattered dismally against the panes, and my candle was nearly burnt out, when, by the glimmer of the half-extinguished light, I saw the dull yellow eye of the creature open; it breathed hard, and a convulsive motion agitated its limbs. How can I describe my emotions at this catastrophe, or how delineate the wretch whom with such infinite pains and care I had endeavoured to form? His limbs were in proportion, and I had selected his features as beautiful. Beautiful!—Great God! His yellow skin scarcely covered the work of muscles and arteries beneath; his hair was of a lustrous black, and flowing; his teeth of a pearly whiteness; but these luxuriances only formed a more horrid contrast with his watery eyes, that seemed almost of the same colour as the dun white sockets in which they were set, his shrivelled complexion, and straight black lips. The different accidents of life are not so changeable as the feelings of human nature. I had worked hard for nearly two years, for the sole purpose of infusing life into an inanimate body. For this I had deprived myself of rest and health. I had desired it with an ardour that far exceeded moderation; but now that I had finished, the beauty of the dream vanished, and breathless horror and disgust filled my heart. After we finished reading this passage aloud—again, a fundamental kind of rereading—I asked students to point to the exact word when Frankenstein’s attitude toward his creation changes from delight to revulsion. Literally—I asked students to point with their finger to the spot on the page where this transformation occurs. They had to physically touch the page with their index finger, and leave it there, while we consider the class’s various answers. I’ve borrowed this pointing method from Peter Elbow, who uses it in the context of teaching composition. In Elbow’s method, peer readers help their fellow writers by pointing to words that resonate with them. But pointing works just as well when reading literary works. There’s something about that tactile connection with the page that for a moment is far more meaningful to the student than anything he or she might have underlined or highlighted. And here, in this exercise, pointing forces students to make a choice, to take a stance with the text. There’s no hemming and hawing, no vague determination that the transformation in question happens somewhere on page 85 or wherever. None of these considerations would have been as easily accessible to us without, first, reading the passage, and then, rereading it. And more precisely, rereading it aloud. When students read aloud they become voices in the classroom, authorities in the classroom, empowered to speak both during the reading and even more critically, after the reading. Last week I was a guest of the Davidson College Teaching Discussion Group, where I was invited to talk about my pedagogical strategies for teaching large classes. I mostly focused on how I use technology to preserve what I value most about teaching smaller classes. But many of the technique I discussed are equally applicable to any class, of any size. For participants in the discussion group (and anyone else who is interested), I’ve rounded up a few of my ProfHacker posts, in which I describe in greater detail how I incorporate technologies like blogging and Twitter into my courses. Foursquare and its brethren (Gowalla, Brightkite, Loopt, and so on) are the latest social media darlings, but honestly, are they really all that useful? Sharing your location with your friends is not very compelling when you spend your life in the same four places (home, office, classroom, coffee shop). Are these apps really even fun? Does becoming the Mayor of a Shell filling station or earning the Crunked badge for checking into four different airport terminals on the same night* count as fun? I hope not. In truth, making fun of Foursquare is more fun than actually using Foursquare. *The Crunked badge is for checking into four separate locations during a single evening. They don’t all have to be airport terminals. That’s just my own quirk. Aside from the free chips I got for checking into a California Tortilla, the only redeeming value of these geolocation apps is that they offer the slightest glimmer—a glimmer!—of creative and pedagogical use. While some of the benefits of geolocation have been immediately seized upon by museums and historians—think of the partnership between Foursquare and the History Channel—very few people have considered using geolocation in a literary context. Even less attention has been paid to the ways geolocation can foster critical and creative thinking. So I’ve been pondering re-purposing Foursquare and its ilk in ways unintended and unforeseen by their creators. [pullquote align=”right”]Let’s turn locative media into platforms for renegotiating space and telling stories[/pullquote]Following Rob MacDougall’s call for playful historical thinking, I’ve been imagining what you could call playful geographic thinking. Let’s turn locative media from gimmicky Entertainment coupon books and glorified historical guidebooks into platforms for renegotiating space and telling stories. Let’s turn them into something that truly resembles play. And here I’ll use Eric Zimmerman and Katie Salen’s concept of play: free movement within a more rigid structure. In this case, that rigid structure comes from the core mechanics of the different geolocation apps: checking in and tagging specific places with tips or comments. What’s supposed to happen is that users check in to bars or restaurants and then post tips on the best drinks or bargains. But what can happen, given the free movement within this structure, is that users can define their own places and add tips that range from lewd to absurd. This is exactly what Dean Terry is doing. Along with his colleagues and students at the Emerging Media and Communication program at the University of Texas at Dallas, Dean has been renaming spaces and making his own places. Even better, Dean and his group at the MobileLab at UT Dallas are not only testing the limits of existing geolocation apps, they’re building one of their own. I’m not designing my own app, but I am playing with the commercial apps. And again, by playing, I mean moving freely within a larger, more constrained structure. For instance, within my dully named campus office building, Robinson A, I’ve created my own space, The Office of Incandescent Light and Industrial Runoff. Which is pretty much how I think of my office. And I’m mayor there, thank you very much. Likewise, when I’m home, I often check into the Treehouse of Sighs. I have an actual treehouse there, but the Treehouse of Sighs is not that one. The Treehouse of Sighs exists only in my mind. It’s a metaphysical Hotel California. You can check in any time you like, but you can never be there. All of this play has led me to think about using geolocative media with my students. Next spring I’m teaching an undergraduate class called “Textual Media,” a vague title that I’ve taken to describing as post-print fiction. My initial idea for using Foursquare was to have students add new venues to the app’s database, with the stipulation that these new venues be Foucauldian “Other Spaces”—parking decks, overpasses, bus depots, etc.—that stand in sharp contrast to the officially sanctioned places on Foursquare (coffee shops, restaurants, bars, etc.). One of the points I’d like to make is that much of our lives are actually spent in these nether-places that are neither here nor there. Tracking our movements in these unglamorous but not unimportant unplaces could be a revelation to my students. It might actually be one of the best uses of geolocation—to defamiliarize our daily surroundings. I recently participated in a geolocation session at THATCamp that helped me refine some of these ideas. We had about fifteen historians, librarians, archivists, literary scholars, and other humanists at the session. We broke off into groups, with the mission of hacking existing geolocation apps for teaching or learning. I worked with Christa Willaford and Christina Jenkins, and as befits brainstorming about space, we left the windowless room, left the building entirely, and stood out near a small field (that’s not even on the outdated satellite image of the place) and came up with the idea we called Haunts. Haunts is about the secret stories of spaces. Haunts is about locative trauma. Haunts is about the production of what Foucault calls “heterotopias”—a single real place in which incompatible counter-sites are layered upon or juxtaposed against one another. The general idea behind Haunts is this: students work in teams, visiting various public places and tagging them with fragments of either a real life-inspired or fictional trauma story. Each team will work from an overarching traumatic narrative that they’ve created, but because the place-based tips are limited to text-message-sized bits, the story will emerge only in glimpses and traces, across a series of spaces. [pullquote align=”left”]They’ve stumbled upon a fictional world haunting the real one. [/pullquote]Emerge for whom? For the other teams in the class. But also for random strangers using the apps, who have no idea that they’ve stumbled upon a fictional world augmenting the real one. A fictional world haunting the real one. Another twist subverts the tendency of geolocation apps to reward repeat visits to a single locale. Check in enough times at your coffee shop with Foursquare and you become “mayor” of the place. Haunts disincentivizes multiple visits. Check in too many times at the same place and you become a “ghost.” No longer among the living, you are stuck in a single place, barred from leaving tips anywhere else. Like a ghost, you haunt that space for the rest of the game. It’s a fate players would probably want to avoid, yet players will nonetheless be compelled to revisit destinations, in order to fill in narrative gaps as either writers or readers. [pullquote align=”right”]Imagine the same traumatic kernel, being told again and again, from different points of views. [/pullquote]The final twist is that Haunts does not rely only upon Foursquare. All of the geolocative apps have the same core functionality. This means that one team can use Foursquare, while another team uses Gowalla, and yet another Brightkite. Each team will weave parallel yet diverging stories across the same series of spaces. Each Haunt hosts a number of haunts. The narrative and geographic path of a single team’s story should alone be engaging enough to follow, but even more promising is a kind of cross-pollination between haunts, in which each team builds upon one or two shared narrative events, exquisite corpse style. Imagine the same traumatic kernel, being told again and again, from different points of views. Different narrative and geographic points of views. Eventually these multiple paths could be aggregated onto a master narrative—or more likely, a master database—so that Haunts could be seen (if not experienced) in its totality. There is still much to figure out with Haunts. But I find the project compelling, and even necessary. The endeavor turns a consumer-based model of mobile computing into an authorship-based model. It is a uniquely collaborative activity, but also one that invites individual introspection. It imagines trauma as both private and public, deeply personal yet situated within shared semiotic domains. It operates at the intersection between game and story, between reading and writing, between the real and the virtual. And it might finally make geolocation worth paying attention to. As entertaining as it might be to hear me talk for thirty minutes, I thought it would be better to see the visuals that accompanied my presentation. So I’ve put together a screencast combining the audio and my slideshow. I shaved off the 30 minute Q&A session that followed, not because it wasn’t interesting (it truly was), but because I didn’t have a handy set of visual adds to go along with it. Perhaps I’ll create a screencast for the discussion part of the day, once I have time to put together some scenes that make sense. 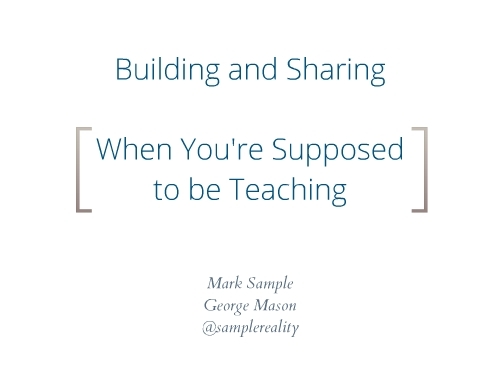 View more presentations from samplereality. What happens when the scholarship of teaching meets Web 2.0? Professor Sample argues the ideal result is the open source professor, a teacher and scholar who applies the tenets of the open source software community to his or her own professional life. This means sharing, conversation, collaboration, and reflection at every step in the teaching and research process, not just with the final product. Technology plays a key role in making open source professing possible, and Professor Sample will discuss the philosophical and practical implications of such a transparent approach to pedagogy and scholarship, as well as possible pitfalls for untenured faculty. Come out to the University of Maryland in two weeks to see me, or stay tuned for information about the podcast. If I sound smarter than I really am, that’s because the webcam adds 10 points to your IQ. Last week I described the intensive role of social networking in my teaching. Although I explained how I track and archive my students’ Twitter activity, I didn’t describe what they actually do on Twitter. That’s because I wasn’t sure myself what they do. I mean, of course I’ve reading their tweets and sending my own, but I hadn’t considered in a systematic way how my students use Twitter. That lack of reflection on my part echoes my initial guidelines to the students: my instructions were only that students should tweet several times a week at a minimum. I was deliberately vague about what they should tweet about. I didn’t want overly specific guidelines to constrain what might be possible with Twitter. I wanted my students’ Twitter use to evolve organically. Now, six weeks into the semester, clear patterns are discernible and I can begin to analyze the value of Twitter as a pedagogical tool. My most surprising find? Twitter is a snark valve. Let me step back and explain. You can also find a downloadable version of my revised matrix on Scribd. 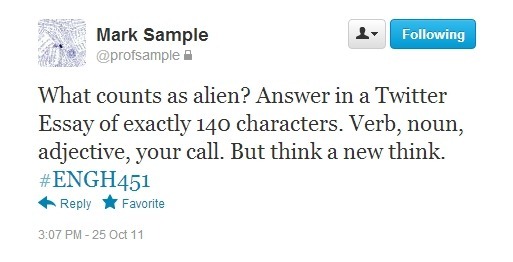 In other words, one of the most common uses of Twitter among my students is snark. And that is a good, powerful thing. I know critics like David Denby have come down hard on snark as a pervasive, degraded, unproductive form of discourse. I couldn’t disagree more. Snark is, I argue, a legitimate way to engage culture. It’s involved, it’s witty, and most importantly, it takes an oppositional stance — a welcome reprieve from the majority of student writing, which avoids taking any stance at all. [pullquote align=”right”]Back-of-the-classroom tittering has turned into backchannel Twittering[/pullquote]Judging by the high level of discourse and analysis in my classes, Twitter is a snark valve. By having a systematic, constrained outlet for the snipe and snark and sarcasm that smart twenty-year-olds might otherwise direct towards more civil discourse, or unleash outside of the classroom, or worse, bottle up, the Twitter snark valve frees up both class and the class blog for more “serious” dialog. And I’m putting “serious” in scare quotes because I believe even sardonic comments provide insight — insight into the topic under discussion, but also insight into how it’s being received by students. I allow — and even encourage — students to Twitter during class. One outcome of this freedom is that back-of-the-classroom tittering has turned into backchannel Twittering. Even more interesting, though unmeasurable without further analysis, is the performative aspect of the backchannel. The tweets are unfiltered, in effect, the same comment somebody might mutter under his or her breath, uncensored, no-holds-barred opining. Yet the students know classmates are following the course hashtag and at the very least that I am listening (and contributing) as well. The backchannel assumes a Bakhtinian double-voiced discourse — using sarcasm both to show a kind of too-cool-for-school attitude but also to demonstrate that the student is in fact earnestly engaged with the material. As the semester goes on and tweets accumulate, I should have more data to work with. 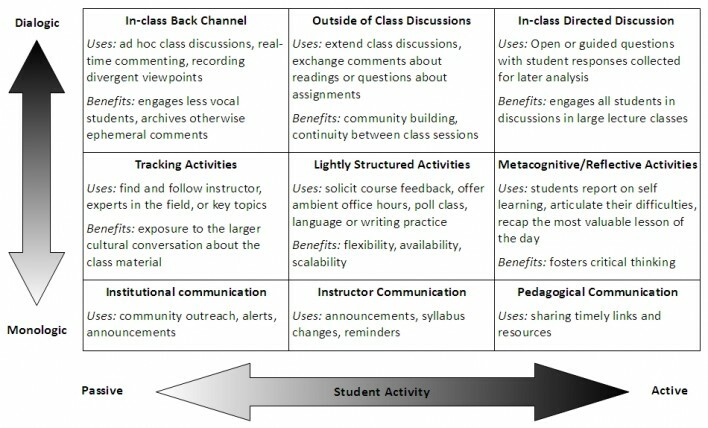 But even at this early stage, I am certain that I have stumbled upon a complicated rhetorical dynamic I never would have imagined going just from the Twitter Adoption Matrix, a dynamic that illustrates how students find their own uses for technology, racing far ahead of our pedagogical intentions. I’m five weeks into the new semester, and it’s time to consider how my ambitious technology-heavy Graphic Novel course is going. And I’m serious when I say it’s technology-heavy: we’re doing a blog, a wiki, Twitter, and rigorous Pecha Kucha presentations. About the only thing we’re missing is a MMORPG. I wanted to use technology to help me maintain the student-centered environment of a smaller class when I was in fact going to be teaching a much larger class (there are 40 students in the class instead of the usual 25). Let’s call this goal community-building. I wanted to use a range of smaller, low-stakes writing assignments paced steadily throughout the semester instead of two or three major assignments. My intention was to keep students continually engaged throughout the semester rather than “checking in” once mid-semester and once at the end. Let’s call this goal focus-sustaining. The chief mechanism of the class is The Group. My 40 students are evenly divided into five groups, and each week they rotate group roles. For example, last week students in Group 1 were responsible for the collaboratively-written class notes on the wiki, while this week they are the class’s Searchers, charged with blogging short evaluative reviews of relevant online resources. The group has next week off and the week after that, they are Respondents, commenting upon the work of another group (the First Readers) on the blog. And in the midst of all this activity, students are expected to post to Twitter using the class’s hashtag (#eng493) and prepare class presentations following the strictly defined Pecha Kucha format (20 slides at 20 seconds per slide, focused on a single page from the week’s graphic novel). My inspiration for all these activities came from a number of sources, which I simply pulled together and stitched into a cohesive structure: the initial idea of groups came from my friend and longtime collaborator Randy Bass; the wikified class notes were based on something similar Brian Croxall does; the use of Twitter in the classroom was influenced by Dave Parry’s thoughts on the matter; and I’m indebted to my George Mason colleague Doug Eyman for introducing me to the idea of Pecha Kucha. So how is it all working? Preliminary evidence suggests it’s working, and working well. When it’s only the second week of the semester and a student hopes aloud that all our collaborative work will remain online after the semester’s over, that’s a good sign. When students in my other class spontaneously start their own Twitter hashtag after hearing about this class’s, that’s a good sign. When students are documenting the class discussion with photographs and adding them to the wiki, that’s a good sign. When I am seeing the most disciplined and focused undergraduate presentations of my career, that’s a good sign. RSS is my friend. Seriously. I can’t emphasize this enough. Being able to read blog posts, Twitter updates, and changes to the wiki pages all in one integrated stream is essential. Postbox is always open on my laptop and I can see at a glance how much activity there’s been with the students. Unread items are in bold, which helps me keep track of what I’ve read (and graded) and what I haven’t. Grading doesn’t have to be hard. As I’ve written elsewhere, I use a simple 0-4 point scale to rate the critical value of each entry on the blog. As a matter of routine, I’ll let students know their grade on the blog if they are habitually getting less than 3 or 4 points per post. I also comment on several posts a week, to let everyone know that I am indeed reading their work. By the end of the semester I plan to have commented on every student’s work at least three times. So there you have it, some reflections on a technology-driven syllabus. These reflections are strictly from my own perspective, of course. Something I need more information about, then, is what my students think about the technology in the course. My sense is that it’s a daunting amount of activity for them to keep track of. I sometimes forget that students have three or four other courses besides mine, each with their own demands. I’m hoping that some activities, like Twitter, fit into their existing lifeflow, though I know others, like working with a wiki, can punctuate their daily lives in a disruptive way. Then again, the kind of estrangement and readjustment such pedagogical tools precipitate can be valuable in their own right, if only they’re harnessed properly…something I’ll be writing about soon. Julie Meloni over at Prof. Hacker has a good rundown of the kinds of questions a professor should think through when he or she integrates a blog into the classroom. I’ve been using blogs in my teaching for several years now, so I wanted to share a few ideas that have worked for me. I’m no expert and I’m still casting about for solutions to some of the more nagging problems, but after thirteen course blogs spread across seven semesters (I just counted! ), I have obtained a small measure of experience. In other words, I keep making mistakes, but at least not the same ones over and over. My university has bought into the Blackboard machine and does not offer any non-proprietary online platform. Since I refuse to restrict access to my content (and by extension, my students’ content), I host all of my class blogs right here, on samplereality.com, using WordPress. Of course not everyone is geeky enough to own their own domain name (although you should, you really, really should), but there are dozens of places where you can host a class blog for free — so don’t feel like you have to use whatever “online educational solution” your campus throws at you. One advantage of hosting everything myself is guaranteed permanency — I have a persistent archive of my online class conversation that I will never lose, because nobody else controls it. And in fact, former students have told me how valuable it is to be able to revisit half-forgotten blog posts long after they’ve finished the class. I’ve always used group blogs in my classes: one central, collaborative blog where every students posts. I prefer this format over the hub model, in which an official class site links out to individual student blogs spread across the students’ own preferred blogging platforms. If nothing else, the group blog makes my job easier. I can read all the posts in one place. It also makes it more likely that students will read each other’s posts, generating a sense of momentum that is so important to the students’ buy-in of class blogging. But what about that momentum? How do you get students to post? How do you get students to do anything? Each student will contribute to the weekly class blog, posting an approximately 500-word response to the week’s readings. There are a number of ways to approach these open-ended posts: consider the reading in relation to its historical or theoretical context; write about an aspect of the day’s reading that you don’t understand, or something that jars you; formulate an insightful question or two about the reading and then attempt to answer your own questions; or respond to another student’s post, building upon it, disagreeing with it, or re-thinking it. In any case, strive for thoughtfulness and nuance. To ensure that everyone has a chance to read the blog before class, post your response by midnight the evening before class. 4 Exceptional. The journal entry is focused and coherently integrates examples with explanations or analysis. The entry demonstrates awareness of its own limitations or implications, and it considers multiple perspectives when appropriate. The entry reflects in-depth engagement with the topic. 3 Satisfactory. The journal entry is reasonably focused, and explanations or analysis are mostly based on examples or other evidence. Fewer connections are made between ideas, and though new insights are offered, they are not fully developed. The entry reflects moderate engagement with the topic. 2 Underdeveloped. The journal entry is mostly description or summary, without consideration of alternative perspectives, and few connections are made between ideas. The entry reflects passing engagement with the topic. 1 Limited. The journal entry is unfocused, or simply rehashes previous comments, and displays no evidence of student engagement with the topic. 0 No Credit. The journal entry is missing or consists of one or two disconnected sentences. I strive for as much transparency as possible, so it’s essential that your expectations (i.e. the rubric) are explained to the students early on, and always available for them to review later. Once I have a few exemplary posts on the blog, I like to walk the class through what makes those posts exceptional (with the authors’ permission). I mentioned that grades are a superficial way of showing students what we value. Direct and immediate descriptive feedback does more than a single letter or number can. So to deepen students’ understanding of their own work, I comment on every student’s blogging at least twice throughout the semester. These are public comments, posted below the blog post, again contributing to the collaborative and transparent ecosystem of the blog. Begin by printing and reading all of your posts and comments (you can access a list of your posts from the Archive menu at the top of the site). As you reread them, take notes, critically reading your entries as if they were written by somebody else (or at the very least, recognizing that they were written by a different you at a different time). Compose a short analysis and reflection of your posts. This meta-post is open-ended and the exact content is up to you, although it should be thoughtful and directed. Feel free to quote briefly from your own posts or to refer to specific ideas from the readings we’ve studied so far. Some questions to consider might include: What do you usually write about in your posts? Are there broad themes or specific concerns that reoccur in your writing? Has the nature of your posts changed in the past five or six weeks? What changes do you notice, and how might you account for those changes? What surprised you as you reread your work? What ideas or threads in your posts do you see as worth revisiting? What else do you notice? What aspects of the weekly blogging do you value most, and how does it show up in your posts? This blogging about blogging invariably ends up being a pivotal moment in the students’ relationship to the class blog. It’s when they begin to have a sense of ownership over their ideas, a kind of accountability that carries over into their class discussion and other written work. It’s also when they truly realize that they’re engaged in a thoughtful, thought-provoking endeavor. It’s when the blog becomes more than a blog.